Wireless carrier AT&T and OpenPeak Inc, leading provider of multimedia touch-screen devices, recently announced the launch of a new powerful, multipurpose computing tablet device boasting support for AT&T's mobile broadband wireless service, based on the ultra-sleek OpenTablet. According to the pair, the upcoming device is expected to deliver communications, entertainment and home management capabilities, and should become available for purchase later during the ongoing year. 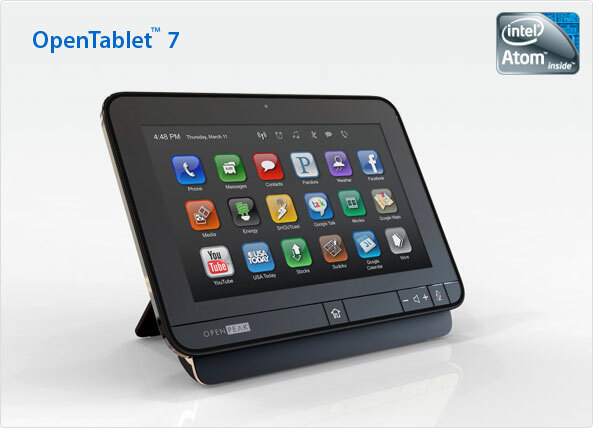 The tablet will come with AT&T wireless connectivity, while also sporting 802.11b/g/n Wi-Fi and Bluetooth capabilities, and will be based on Intel’s next generation handheld platform, codenamed “Moorestown.” The device is set to prove a great option for social networking activities, Internet browsing, music, video and photo sharing, or instant messaging. At the same time, the OpenTablet includes the OpenPeak Device Management Services, as well as the OpenPeak App Shop, its maker notes. Users will enjoy the possibility to remotely provision, monitor and update the tablet via the device management solution, while the app portal will offer access to a series of multimedia and home management software solutions from third-party developers. The tablet is powered by an Intel Atom chipset, comes with a high-resolution 7-inch multi-touch TFT LCD screen, and sports an HDMI output, USB interface and MicroSD slot for additional storage space to be added into the equation. The device measures 9 inches by 5 inches, and is only 0.59 inches thick, while weighing in at 1.15 pounds. Users will enjoy a wide range of features on the device, especially with the connectivity with AT&T’s 3G mobile broadband network it will include. Sony Computer Entertainment has just announced that its motion controlling scenario titled Move is scheduled for a fall 2010 release. Looking to give Microsoft’s Project Natal a run for its motion sensing money, Move will require you to also purchase the PlayStation Eye Camera for full compatibility. Additionally, the motion controller, which looks like some sort of Killer Clowns From Outer Space device, will also come with a sub-controller similar to the Wii Nunchuk to help you navigate the 3rd dimension. Using all 3 peripherals together will create a tight and precise representation in 3D space allowing for the gamer to be fully immersed while playing themselves in the game. Bring it on Lawnmower Man! The Playstation Move utilizes some advanced motion sensors that include: a three-axis gyroscope, a three-axis accelerometer, and a terrestrial magnetic field sensor. These words might not mean much to the gamer right now, but once people start busting a “Move” they could easily become everyday jargon. The PlayStation Move motion controller employs action buttons, an analog trigger, force feed back, and visual feedback via the color changing sphere. The Eye Camera will also detect the player’s voice and image for further immersion and augmentation. Both controllers act like normal PS3 Gamepads that have lithium-ion rechargeable batteries and BlueTooth. No price has been set as multiple packages are likely to emerge, but word has it that over 36 publishers have stated their support and there should be over 20 games at launch time this fall.